A skin reaction to an insect bite can be itchy and painful. Knowing what to look for and what to do if you develop a rash from a bug bite can ease your symptoms and provide you with peace of mind. 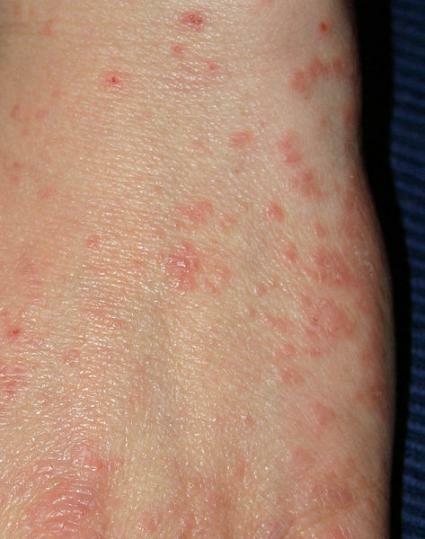 A rash is an area of inflamed or irritated skin, and it can have various causes. Sometimes a bug bite rash is confused with other conditions, such as fungal infections and common skin allergies, because it resembles one of them. The following descriptions and photos of rashes caused by common insect bites may help you learn to tell the difference. Bed bugs bite humans and animals to feed off their blood. 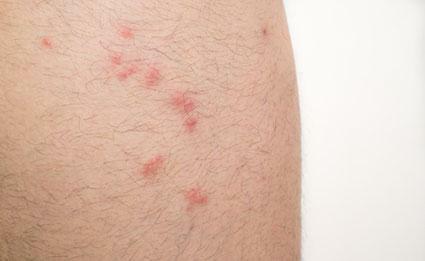 The wound can appear as one or more red bumps because bed bugs bite their victims several times in a night. 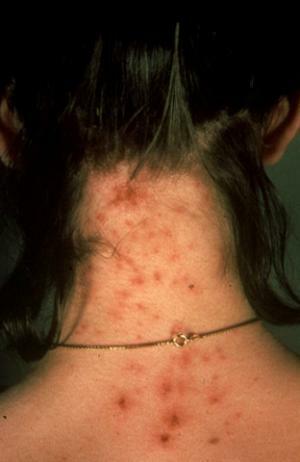 The itchy rash often appears as a row or clusters of round, flat or raised red lesions at the site of the bites. Substances in the saliva cause an allergic reaction, which contributes the way the rash looks. Itching begins about an hour after the bugs bite. For some people, the rash might not appear for days or a week depending on the body's reaction to the saliva, and the area might remain swollen for weeks before clearing. Mosquito bites cause a local reaction and itching. The resulting rash may look like blisters or bruises and have a large area of swelling at the site. 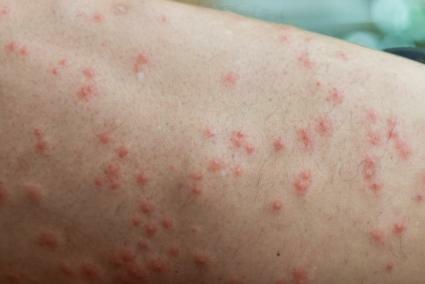 The bites can also cause other types of rashes depending on the disease the mosquito transmits, such as the widespread, red-mottled skin rash of dengue fever transmitted by the bite of the Aedes aegypti mosquito. The skin rash caused by the bite of the chigger mite is usually found around the ankles and waist, or in warm skin folds like the ones between toes. The bugs are most often present in grassy and wooded areas, and they tend to fall off the skin after a few days of feasting. Chigger mites attach to skin and inject their saliva into a bite which might be painless at the time it happens. 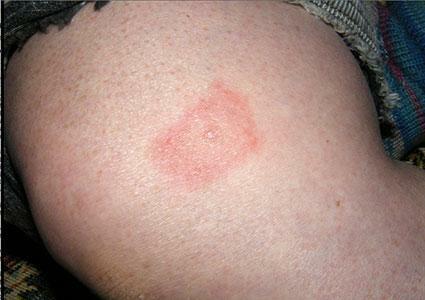 Angry-looking red bumps appear and an allergic rash or welts can occur several hours after the chiggers attach. Itching can be severe, and the rash might only be present on areas which have been exposed to the sun. Dog or cat fleas can bite humans too. The resulting skin rash occurs because of an allergic reaction to the flea's saliva. 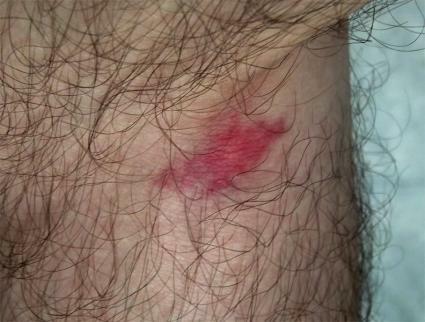 These red bumps are surrounded by small areas of inflammation. The rash caused by these wingless bugs can itch for several weeks, and scratching creates a risk of infection in the area. Ticks can carry bacteria which cause conditions such as Rocky Mountain spotted fever and Lyme disease. 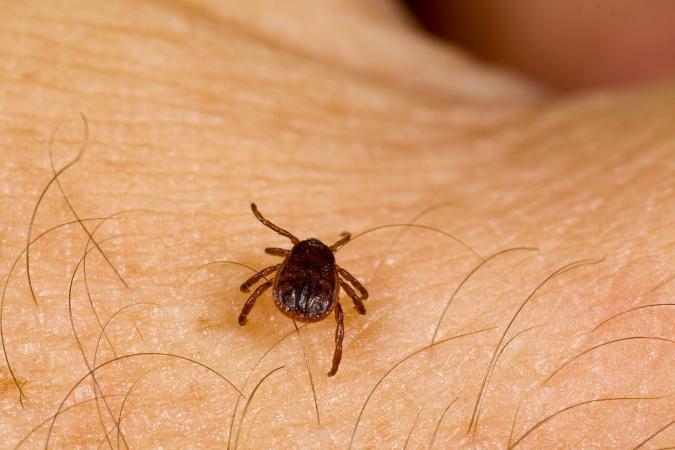 The rash of Lyme disease might develop one to four weeks after a tick bite. It looks like a flat, round patch with a bulls-eye that may increase in size over a few days and several of these patches might be present. 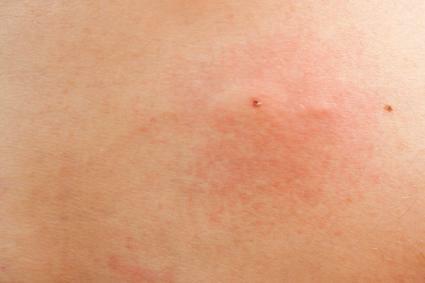 The central bulls-eye is the site of the tick bite from which the rash spreads out. Ticks live on deer, squirrels, horses, and other animals, but they can latch on to humans to feed on their blood. If you suspect that you were bitten by a tick after being outdoors and develop a rash, fever, and muscle and joint pains, seek medical attention. Lyme disease infection can lead to serious illness. Scabies are insect-like bugs which burrow under the skin after they bite. They cause multiple red bumps, pustules, or vesicles which are very itchy and can crust over when they drain. Small, red lines mark these mites' under-the-skin tracks. 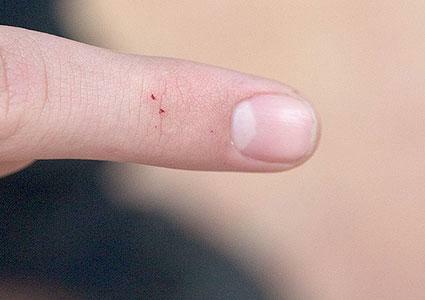 Common sites of bites include in between the fingers, on the wrists and arms, on the buttocks, and in the groin. The intense itching can be worse at night due to substances secreted by the mites and the eggs they lay under the skin. Lice commonly infect the scalp, pubic area, and other parts of the body, and they can leave small bite marks on visible areas including the neck and shoulders. The rash that develops around these tender bumps is very itchy. The area can become infected from scratching, which causes it to ooze and become crusty. Horse flies bite horses and other large animals, including humans, and a weal appears at the site of the painful bite. A local allergic, red rash is also common, and some people can develop bigger fluid-filled welts. A more severe reaction causes body hives, wheezing, dizziness, and other systemic symptoms. Black flies also feed on the blood of animals and humans. These flies tend to bite the ears, neck, and ankles where the skin is thinner. The bite might be painless, but it can leave a small, itchy red puncture at the site or larger swelling around the area. A bigger reaction to the fly's saliva can cause systemic symptoms such as fever, headache, and joint pains. Black flies can also transmit other organisms such as the parasitic worm that causes river blindness. The biting midge fly lives near water and damp locations and can attack animals and humans. Their bites can cause severe itching at the site. A local allergic reaction to the midge's saliva raises a small red welt. Some species of midges can transmit viruses, worms, and other pathogens to their victims. The brown recluse spider usually inhabits dark spaces such as closets, attics, basements, and sheds. This spider's bite is often painless, but it creates a reddish or purplish bulls-eye rash or bruise within a few hours. The skin can blister, rot, and then form a blackened ulcer at the center of the rash. The toxins in the spider's venom can also cause itching, swelling, and pain at the site, as well as general muscle aches, nausea, and vomiting. Seek medical attention as soon as possible if you suspect you were bitten by a brown recluse. Black widow spiders tend to hide outdoors in holes, wood piles, and tree cuttings. 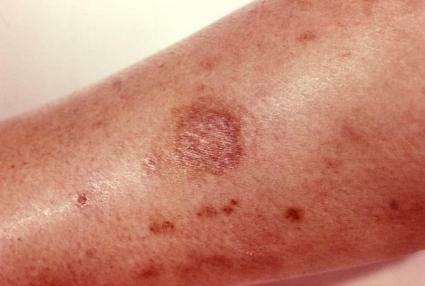 The bite looks like two red puncture marks in the victim's skin, and the rash is limited to two small areas of inflammation around the marks. This spider's bite is often painless, but pain can set in soon after. The venom the spider injects in the skin is poisonous, so seek medical attention immediately after a bite. It can affect a person's nervous system and cause seizures and severe symptoms in other organs such as abdominal pain, vomiting, muscle weakness, or difficulty breathing. The yellow sac spider is found outdoors in shrubs, trees, under rocks, and hiding indoors. It's believed this species causes most of the bites attributed to spiders, and its painful bite also has a burning sensation. The spider's fangs leave two reddish puncture wounds which can form a hard lump or blisters. The skin around the bite breaks down, dies, and then heals itself. As with any suspected spider bite, it is helpful to collect the bug so it can be identified. Biting isn't the only way bugs can cause rashes. Their stings can also affect the skin. An individual's reaction to a bee sting can vary from mild to severe. It can cause an itchy, tender welt, and a small, whitish area often surrounds the bump. A greater allergic reaction to the bee's venom causes a red rash to occur around the immediate area, and a more severe reaction is likely if a person was stung before. The most severe systemic allergic, anaphylactic reaction to a sting can become a medical emergency which could lead to cardiac arrest and death. Symptoms include whole body hives, difficulty breathing, sweating, dizziness, and nausea, and loss of conciousness. Immediate treatment with epinephrine injections can prevent a fatal outcome. A wasp sting can cause a severe allergic reaction. 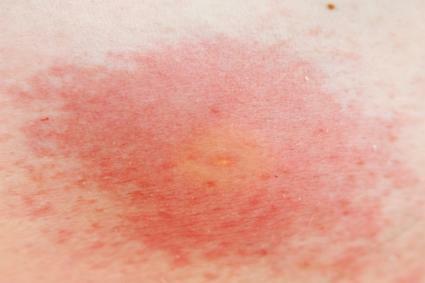 A red rash will appear at the site and swelling, pain and itching might also occur in the area of the sting. Like bee stings, a wasp sting can also cause the victim to have a serious systemic, anaphylactic reaction which requires emergency treatment with epinephrine. The sting of a scorpion can produce a small, painful swelling which itches. An allergic reaction can also occur in people who were previously sensitized to a scorpion bite. Allergic symptoms include skin hives and difficulty breathing, similar to anaphylactic reactions to other bugs. Venomous scorpions can also cause vomiting, disturbed vision, and a serious medical emergency. 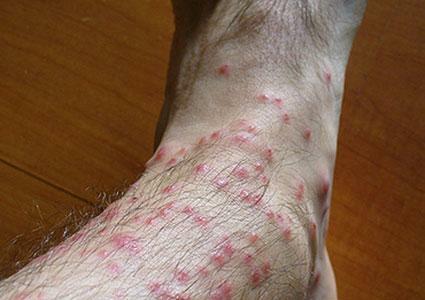 Fire ants cause painful, flat red lesions or pus-filled blisters or pustules which erupt at the sites of the stings. A typical allergic reaction to the venom can cause a red rash and swelling around the bumps. 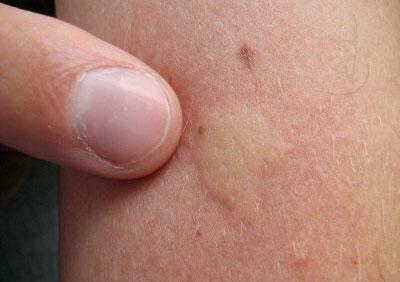 Victims feel an intense burning when stung, and the lesions become itchy soon after. Topical antihistamine creams, steroid creams, or oral steroids are used to relieve the symptoms until the rash resolves. A systemic, anaphylactic reaction can also occur and is treated with epinephrine injections. Some rashes can resolve in a few hours to a few days without treatment. There are several ways relieve some of the symptoms. Hold ice or cool compresses on the rash area. Appy a topical anti-itch ointment or lotion, such as Benadryl (diphenhydramine) or Calamine lotion, to reduce the itching. Home remedies such as applying a baking soda paste or a solution of meat tenderizer and water can help ease pain and itching. Try not to scratch the rash to avoid further irritation, increased itching, more pain, or ulcer formation and infection with bacteria. Consult a doctor if the rash or skin reaction to a bite or sting is large or spreading, or significant local symptoms are not relieved by home remedies. Seek urgent medical attention if you develop a generalized body rash or other symptoms of a systemic, anaphylactic reaction such as headache, shortness of breath, nausea or vomiting, or lightheadedness.